As we raise our children, we face differenct obstacles as they go through different developmental, shall we say, “challenges.” At no time are these challenges more obvious to the world than when we take our family and its unique “baggage,” pun intended, on full display during the family vacation. I remember that, when my children were toddlers, I referred to a vacation as a “relocation.” It was never much of a vacation for me because of the vast amount of equipment, toys, and other belongings that had to be packed, along with my swimsuit and flip flops. I often thought, “why bother?” I always came home exhausted rather than rested, typically having lost something significant along the way, such as a beloved stuffed animal or the plug to something that would not work without the plug,and no way to buy a new plug, etc. Arrgh! I start to perspire just thinking about it! Did I forget to mention all the friends I made while flying with a toddler? Arrgh! Those were the good times . . ..
Our family is now way past the toddler phase, and we have one teenager and one preteen. This is logistically easier, sans the car seat, diapers, and Benadryl, but it brings about a whole new series of challenges. Many families have given up the idea of family time during vacations altogether, or, out of desperation, they opt to haul along a friend of their teen. While this can be an an effective option, it can also be expensive and take away from opportunities for the family to spend those last few dwindling summer moments together without interuption from interlopers, ur, I mean peers. With a friend present on the scene, we lose those opportunities to, and let’s be honest, force our teen to have fun with the whole family. My personal strategy continues to be saying no to bringing the friend along, but trying other ways to encourage a modicum of enthusiasm from my teen. This spring I spoke with my daughter, the teen, and I brought up how precious few summers we have left together. She will be a high school Sophomore in the fall. In painful detail, I spelled out the reality that we only have three summers left before she is off to college. My daughter is a typical teen, and I mostly got a blank stare in response to my tragic epiphany. My obvious panic at the thought of how soon her impending departure from the family unit is, did soften the orb of impenetrability, usually present when I go past two or three uttered sentences, and she was open to a discussion of the topic. The key to the success of this discussion is that you are speaking to your teen about something they want. We all know this has a much higher probability of success than any other topic you are likley to discuss with your teen. I have had my most fulfilling moments, replete with flashbacks to the golden years when my daughter thought I was brilliant, beautiful, and infalliable, when discussing something my daughter wants. It is in these moments that I have her full attention, eye contact, and enthusiasm. Again, let’s be honest. This is when we, as parents of teens, feel the power, albeit waning, that we have left. Enjoy the moment completely, no shame needed, as this, too, will be gone soon enough. Within parameters that you instinctively know about your family, based of course on logistics and finances, offer to make your teen a significant decision-maker in where/what the family goes/does on vacation. Ask them what they would like to do before they go off to college. It may be a place they have never been, such as see the ocean, Grand Canyon, a theme park, or something they have never done, such as a hot air ballon ride, horseback riding, or riding on a Segue. Be creative, and surf the internet together for ideas. Anytime I go near a computer with any of my children or their friends, I learn something new. My newest skill is cutting and pasting. It felt like I had just split the atom. Many times we have ignored treasures that are near our own homes,and these vacations are much less expensive due to the lower travel costs. 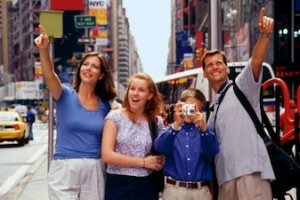 These final opportunities for family vacation time are critical for lasting memories. Put the effort and hard work into making them especially memorable. Another idea from summer vacation with teens is visiting college campuses. Identify those colleges/universities that your teen is considering. Once again, make this about them, and you will be shocked at the level of enthusiasm you will see. After you have chosen the campus to visit, check to see what is in the surrounding area to make sure it is a trip that your other children can enjoy. You may get complaints from younger siblings, but assure them that they, too, will get their time in the sun as they get close to flying the coop, er, I mean leaving the nest. The effort and sacrifice you put toward your family vacation will reap rich rewards. I have heard from many adults that it is what they did with their parents, including trips that they took, and not what their parents bought them, that provide them with positive childhood memories. We have all observed that being in a different environment relaxes and brings out the best in people. Your teen will be less embarrassed by you if they don’t fear seeing a friend watching them do the limbo with mom or dad. However, be sure to get lots of photos. I am not speaking about blackmail. I’m a mental health professional and would never condone that. However, photos of vacations taken together are proof, and I do believe admissable in court, that you are a great parent. Dr. Tucker has 2 children, ages 15 and 10. She has experienced both positive and negative, very negative, experiences while on family vacations. Nonetheless, she would happily relive every precious moment over again.